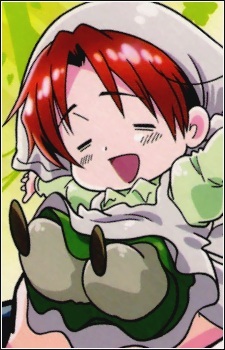 Chibitalia "North Italy, Feliciano Vargas, Ita-chan"
Italy as a child. He was mistaken as being a girl by almost everyone for most of his childhood. He worked in Austria’s house with Hungary who was like a mother to him. Austria made him wear dresses, not knowing of his true gender. Hungary sometimes dressed him up in her traditional clothes for women, knowing full well that he was a boy. The Holy Roman Empire, who also was another that mistook him for a girl, was in love with him. He ended up leaving for war and never came back, but Hidekaz Himaruya promised a happy end to their story.